Josh and I remember guinea fowl from childhood. I first saw them at a farm in Broadway, Virginia and Josh saw them somewhere in southwestern Illinois. We had no idea why anyone would want such an odd looking, loud, strange bird. As fate would have it, Josh and I ended up living in the predacious bug capital of the country: Georgia. With three dogs and a cat, we spent hours pulling ticks out of their tender skin. Chemical treatments did nothing to prevent our poor critters from getting covered with nasty and hungry ticks. After a few months, we started to wonder how anyone had pets in this place! The answer came from an unlikely place: the dump. We made multiple trips to our local dumping spot after moving into our new house and managed to strike up a friendship with the dump attendant (a wonderful elderly gent). We told him about our tick troubles. He smiled knowingly and told us to get guineas but warned, “Keep ’em housed for a while because those jokers can fly!” He wasn’t kidding. We began The Great Guinea Fowl Search that very afternoon and found a breeder in Alabama who agreed to sell us a few guineas. We drove an hour out to a great little farm with birds and goats of every kind. 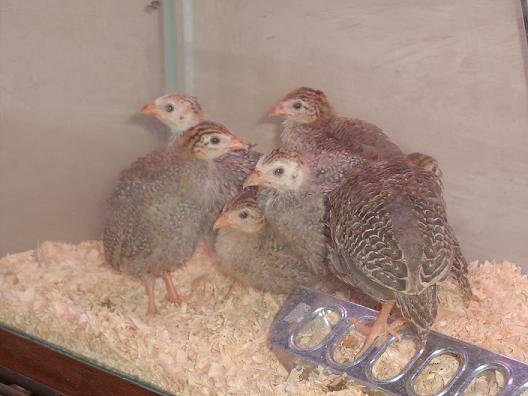 We then purchased a box of six baby guineas (keets). It is best to get them as day-old keets but ours were a few weeks old and had not been handled. (More on this later.) Even as babies, they snapped the air as bugs flew over them. They actually ate a few mosquitoes before they were boxed up. Josh and I were quite pleased and couldn’t wait to unleash them at our house. We began making plans. The breeder looked at us with all the wisdom of a man who has farmed his entire life and said, “Don’t let them out of the coop until they’ve bred or you’ll never see them again.” We were stunned. Could you simply clip their wings? The farmer just laughed. We brought our new babies home and put them in an old aquarium with wood chips for bedding and a lamp for warmth. Within seconds they dumped their water, destroyed the bedding, and flew out of the top of the tank into our living room. Josh and I were shocked. These were just babies! We managed to catch the fly-aways and secured the lid to the tank. Over the next few weeks, we watched our guineas grow and discovered that baby guineas were nothing like chicks — they did not like us at all. They would starve before eating out of our hands. Every time we walked by the tank, they would make strange but soft sounds. They also appointed themselves chief of security. If someone stepped on our front porch, they would be greeted by horrifying shrieks from our tiny guineas. Soon the guineas grew out of the tank and we moved them into a wire mesh run with a converted doghouse (idea from Grit Magazine). The guineas LOVED being outside and immediately began to work on the bug population. We moved the run all over the yard and discovered that wherever the guineas had been became beautiful. The grass under the run would turn a gorgeous healthy green and the weeds were removed (as were grubs, fire ants, and other critters). If we all had guineas… I bet Scotts would go out of business! The best part? The tick population has been greatly reduced! 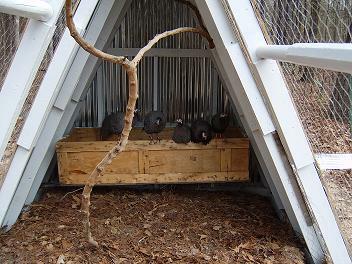 All six guineas stayed in the chicken tractor for about two months and then moved to the guinea house. If we’d had the choice, we would have moved them into the bigger house at five weeks of age. The “A” frame is really only useful for a temperate climate. To use this design in a colder climate, you would need to close off the area that is roofed and possibly even think about installing a heating unit (this greatly depends on just how cold your climate may be). 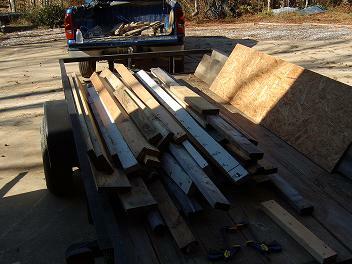 We decided to use recycled wood from a scrapyard. The upside is that you get free wood and you are helping the environment. The downside is that you have to be a little bit more creative (i.e., 2 5′ 2×4’s = 1 10″ 2×4, etc. ), you must paint, and there will be a lot of old hardware that must be removed. 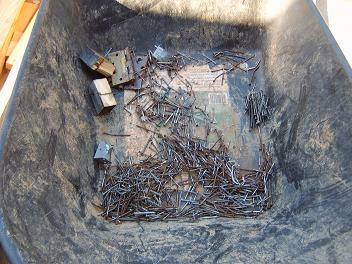 Above, you see the hardware we removed from the recycled wood. We ended up reusing most of this… some lucky finds: 2 hefty hinges which we used for the door to the guinea house. 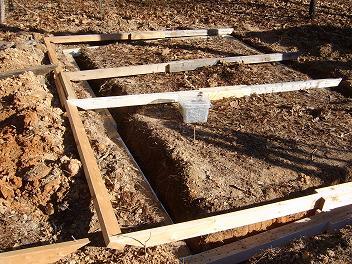 Dig a level foundation (optional) or you can set it directly on the ground. This depends on where you live. 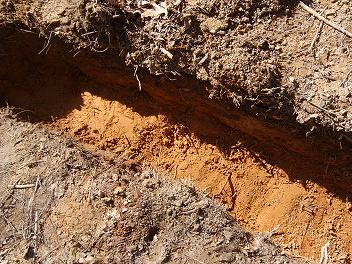 If you live in an area with night prowling predators, you might want to consider digging one. We filled ours with cinnamon to help deter bugs from moving in (oil of clove, oil of peppermint, cedar, rosemary, garlic, lemon eucalyptus extract, and cinnamon are all wonderful natural insect repellents). 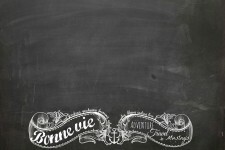 Paint every board you use that is not pressure treated. 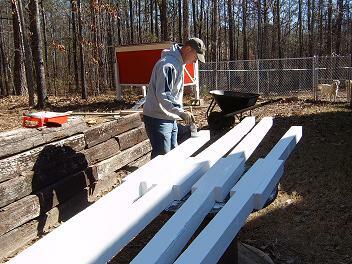 Notice how Josh joined two 7 foot 4x4s to create the 14′ long base boards and two 4 1/2 foot 4x4s to create the 9′ base boards. 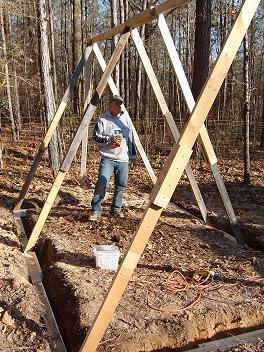 Four 10 foot 2x4s with a base angle 30 degrees and a top ange of 60 degrees creates one side of the “A” frame. They are secured into a 14 foot 2X4 at the top and into the base board on the bottom. Josh cut all 12 2X4’s before and then constructed on side of the wall, then staged the other 2X4’s on the other side to do sort of a “barn raising” technique. Lacy put the camera down to help at this stage! It’s nice to have a buddy to raise the barn! Above, the frame is complete minus the door. 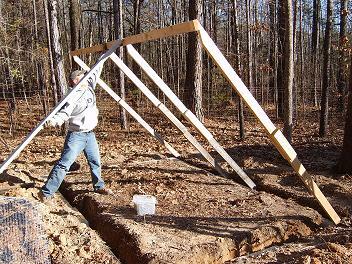 Do not space your 2X4’s further apart than the roofing that you choose to use. If you don’t have a tablesaw, you can use a circular saw, two wood clamps, and a straight piece of wood (for a straight edge). 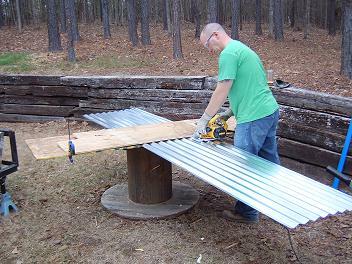 Josh used this technique for both the tin roofing and the wood. Here is the nesting box… which is not necessary because the guineas generally ignore it but we felt uncomfortable about leaving it out. Choose your own adventure here. Ours roosted on the ledge for the most part. For the back wall Josh used a “T” style frame because he wanted to leave the upper portion open for ventilation. You will also notice the nesting box. Any box will do. We were lucky enough to find a military parts box that Josh just had to remove the bottom and add chicken wire or wire mesh. 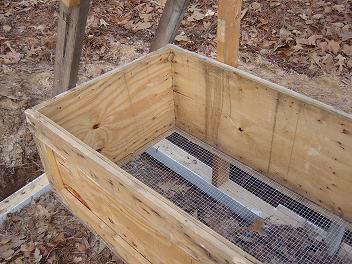 You will also notice that we mounted the nesting box to the back wall suspending it off the ground to make it easier for clean up, now we can easily fit a rake under the box. The cross support beams near the front of pen are old “Alaskan Army Tent” Poles, but any board can be cut to fit. If you are going to be using recycled wood like we had to you will notice that the front and rear “A” frame will have to have the outer support piece of 2X4 removed after the entire coop is constructed, notice on the picture below Josh removed them before he painted. 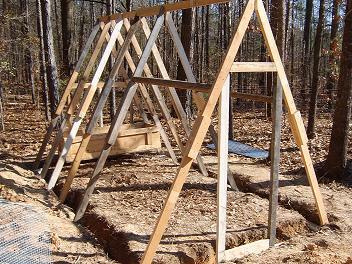 Make sure your coop is level and square before you put the roofing on otherwise your roofing pannels will not line up with your 2X4’s, and Josh thought it was a lot easier to mark and then drill the holes on the ground before putting the roofing up. 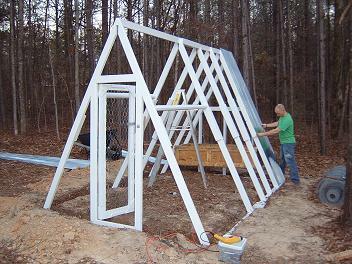 If you are going to use the tin roof like we did then when you install it ensure that you are placing the nails at the top of the bend not at the bottom otherwise it will hold in moisture and shorten the life of both the wood and the metal. When you drive your roofing nails in stop as soon as the rubber casket touches the tin roof otherwise you will bend and warp your tin roof. 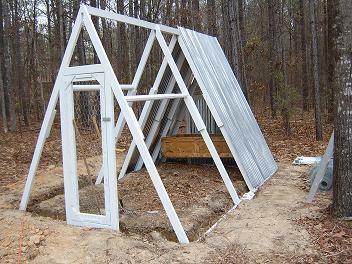 (Above) Completed tin roof and back wall. 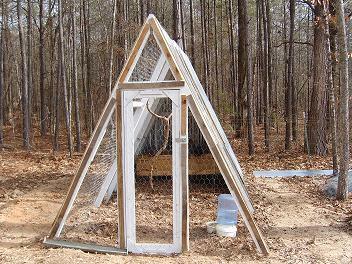 Cut the chicken wire to fit each section and temporarily secure using a staple gun. It helps to use 1/4″x2″ wood strips to help secure the wire so that no animals can get in or out and so that you can stretch the wire tighter. Josh used an old sheet of plywood and just cut it into two inch strips. 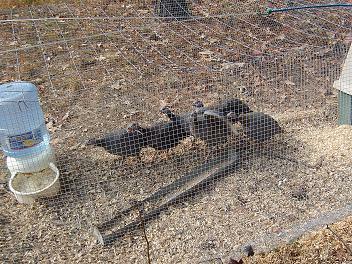 After two weeks in the new “Guinea Hilton,” the guinea fowl were released and allowed to roam the property. They return to their “A” frame each night and sleep on the perch. Want to hear the guineas? 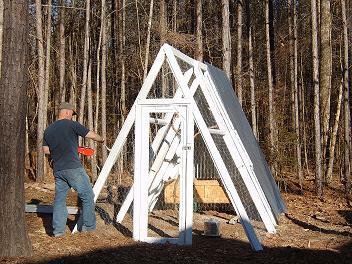 Julie at Elisharose - That looks a lot like an over-sized chicken tractor! We made one of those for our city chickens. Yours is beautiful. Holly the Knitter - I remember guineas on my Uncle Ralph’s egg farm when I was little. I remember they got on my Aunt Eunice’s last nerve! They also had peacocks. We always had peacock feathers when I was a kid. marky - Can I come and live with you? Laurie - Thanks for stopping by my blog and especially for leaving a comment, as well. I have 5 guineas, and I love them. I read about them in the Encyclopedia of Country Living, which says they eat ants, as well as ticks and they will also kill snakes. I raised mine with baby chicks and I think they think they are chickens. Anyway, they stay close to the house, they fly in and out of the chicken yard. Lynnie - I love guinea hens! My mom had several for tick control but never managed the elaborate cage you have. She had a wire fence with a wire top on it. Still, hers got out every day and my brother spent many hours chasing them down. This lasted for a week I think before they finally gave up and let them go wild! marky - I have also heard, so tell me if it is true, that guineas take care of snakes too! Charlie - That has to be the most obnoxious sound around. I would hate living anywhere within proximity to your farm. I personally wish that anyone that owns these type of fowl should be financially liable for all distress that these birds create. You can hear them OVER a 1/4 mile away. This is not an animal that should be kept in any close proximity to other humans. They squawk at EVERYTHING. Keep that in mind. They are great if you don’t like your neighbors or want to make enemies. So I guess that is a plus. Kris - I have read this through several times now & STILL cannot figure out what the heck you have cinnamon listed for? I had someone else read it, too, with the same result. Simple Livin' gal - Charlie — Excellent point! If you are not able to see the benefit of owning these wonderfully useful (and completely delicious) birds, then you honestly have no business living in the country. If noise pollution is the issue… I find loud music (rap, country, salsa, or whatever type) offensive. That music is far more offensive to me than any God-made creature and for this reason — I live in rural Georgia. People who play music that loudly get shot. We had our own troubles with that one! 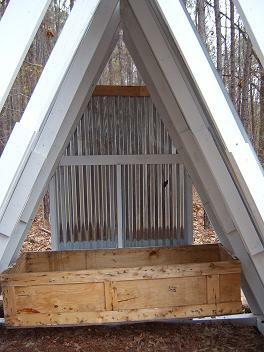 We built the A-Frame with the following variations – just a tad bit shorter in length & width because that’s what I had to work with, opted for roosts rather than a nesting box and used clear corrugated plexiglass on the rear to let the light in but block the north winds in winter. I have a rescue rooster named Abbott who was fascinated by the keets and he eventually adopted them as his flock. He was so patient with them … would just put his head down and let the keets play & pick at his pretty feathers for hours. This has somehow worked out although I keep waiting for the ‘family’ to break up. I have three male & three female Guineas and then Abbott. Where he goes, they go (for the most part) and he comes when called by name. They also love when I get the shaker jar full of white millet if all else fails. Thanks for the A-Frame idea. It has worked out VERY well for us! Simple Livin' gal - Ryan — Congratulations on your new birds! You can build a dual-purpose house for guineas and chickens. Keep in mind that your guineas may decide to live on the roof or in a tree even after all your efforts to provide the perfect housing situation. Karhy - Please help! I need to find out how large of a Guinea house do I need to house 30 guinea’s. We are getting 30 babies in June and I need to build a place for them to reside. Or where to find building plans. Bonnie K - We are really looking into getting guineas. I understand about the noise – and totally expect it. BUT, what about at night? Are they still loud? If so, then I can’t get them. I get really grumpy when there are noises that keep me awake. The chickens/turkeys I grew up with didn’t seem to make nighttime noise, but I want to know about guineas before I get them. Robert Hodge - After the neighbor got 4 Guinea hens; we started to see a lowering of the slug and snail populations. Now, ONE season later, I found the first snail in weeks that they had missed. The Only ones to escape them so far are the skinny brown slugs that Only come out at night. The Japanese beetles in the garden are nearly gone and the Guineas only found the garden about 2 months back !!!! The Flea Beatles that destroyed my Green Beans are very few now. I will buy my own Guineas for the coming years, thank you !! Sow bugs are rare now as well, likewise the earwigs. Marlene - Hi, Anne, I was wondering how you dealt with the food situations with raising keeps and chicks together? I will be getting my keets soon and want to make sure they won’t have any issues with the chicks. quickly make an assortment of various coffee beverages. In deciding on the best coffee maker, you have to get it precisely area. red carpet style - I enjoy what you guys are up too. Such clever work and coverage! 1. Most sources recommend turkey or game bird starter for the guineas, but their protein levels are too high for chickens. Can guineas thrive on chicken starter after all or do I need to maintain separate brooders? Any and all suggestions appreciated! 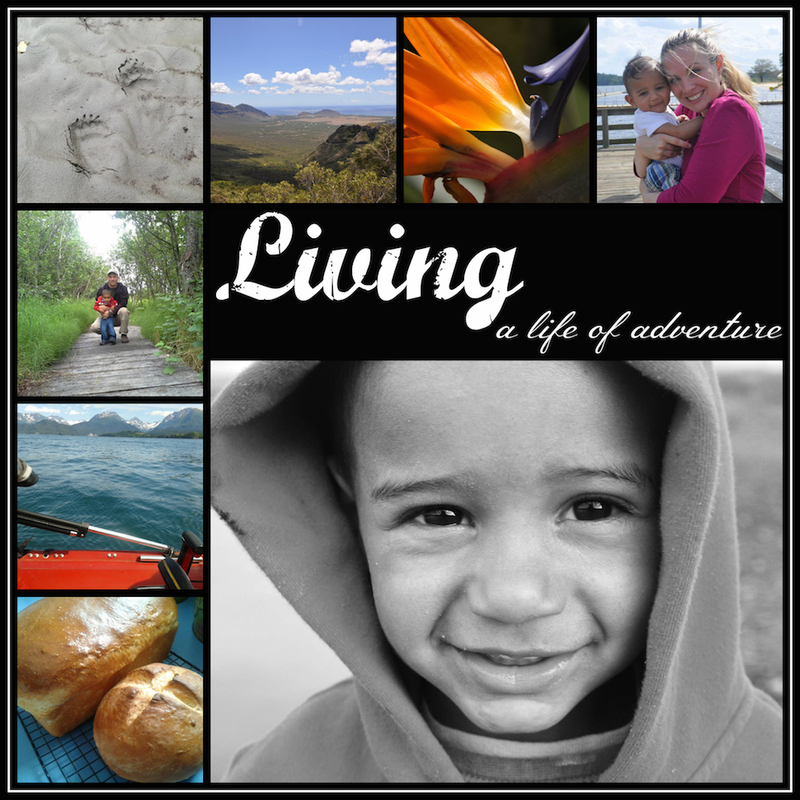 Love your narratives… your love for the country life comes through!